Effective for prevention and treatment of infections in patients with burns and other skin lesions. It fights infection and skin lesions, being effective against microbial germs that develop in burns and other wounds. Also acts as absorbent dressing. 1 gram of cream contains silver sulfadiazine 10 mg.
Also contains macrogol 6-stearate, glycol stearate, macrogol 32-stearate, propylene glycol, cetearyl alcohol, liquid paraffin, macrogol cetostearyl ether 12, methyl parahydroxybenzoate (E218), propyl parahydroxybenzoate (E 216), purified water. It is indicated for prevention and treatment of infections in patients with burns and other skin lesions. The cream is indicated for topical administration in adults and children over 1 month of age. Apply in a thin layer (2-4 mm thickness). Before use, it is necessary to clean and remove the dead skin cells. The cream is recommended to be firstly applied on a sterile dressing, which will be consequently placed on the wound. The cream is applied once daily, with a sterile spatula or with sterile gloves. Generally, the application is repeated after 24 hours. 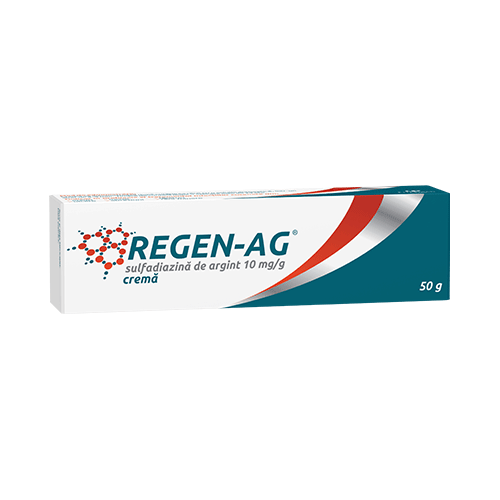 Before each application, the lesion is washed in a stream of antiseptic solution or water in order to remove the residues of cream or the pus-like exudate, but in reality antiseptic, which occurs in abundance after application of Regen-Ag. Store below 25°C, in the original packaging. Do not use after the expiry date, which is stated on the package. After first opening of the tube, use the product within 14 days. Cardboard box containing 1 aluminium tube with 50 g cream.